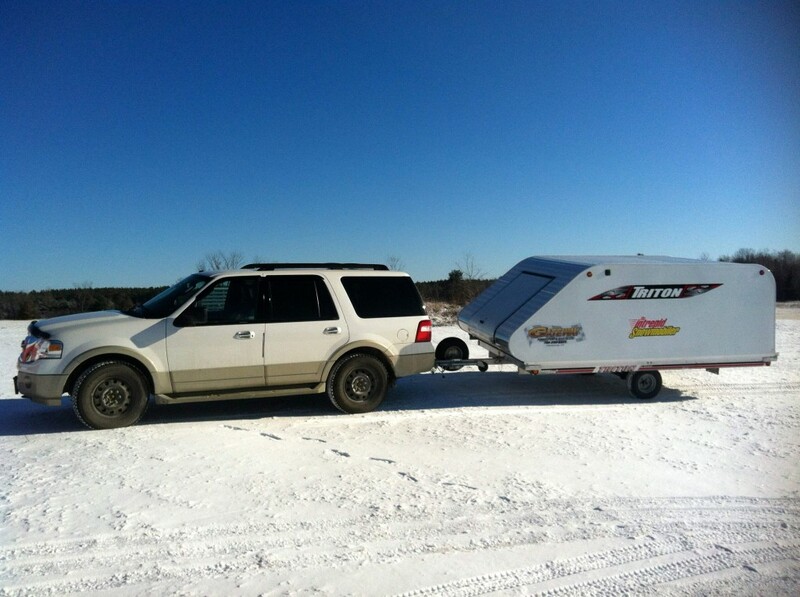 There are many considerations for how to buy snowmobile trailers for your snowmobile tours or snowmobile vacation. In recent years, our search for snow has altered the travel patterns of snowmobilers substantially. For many, the days are gone of being able to ride from their backyards. Instead, buying snowmobile trailers and trailering for hours to reach good snow has become familiar to enthusiasts. That certainly describes me, my Ski-Doo snowmobiles and my Triton trailer. 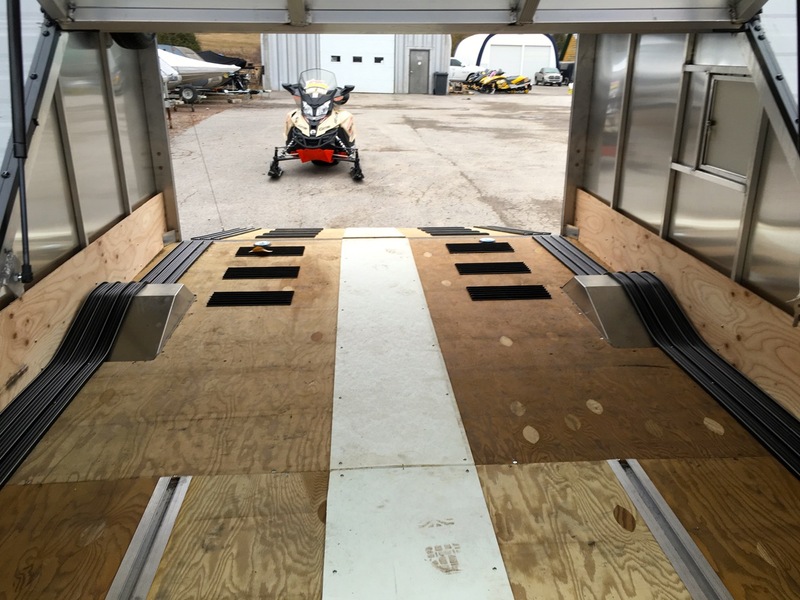 As riders buy a new snowmobile trailer or upgrade to more elaborate ones, there seems to be almost as many choices of snowmobile trailers as there are models of sleds to load on board. And just like with snowmobiles, the market is moving upscale. I should note upfront that the tips in this article apply to snowmobile trailers in general. But if you’re thinking about a 3 or 4-bed enclosed trailer, be aware that things may become more complicated. For example, dual axles and/or the combined gross weight of tow vehicle + trailer may mean you have to complete an annual safety check. Most snowmobilers spend a lot more time choosing a sled than a trailer. Most also invest more in their sled than they do in their trailer. 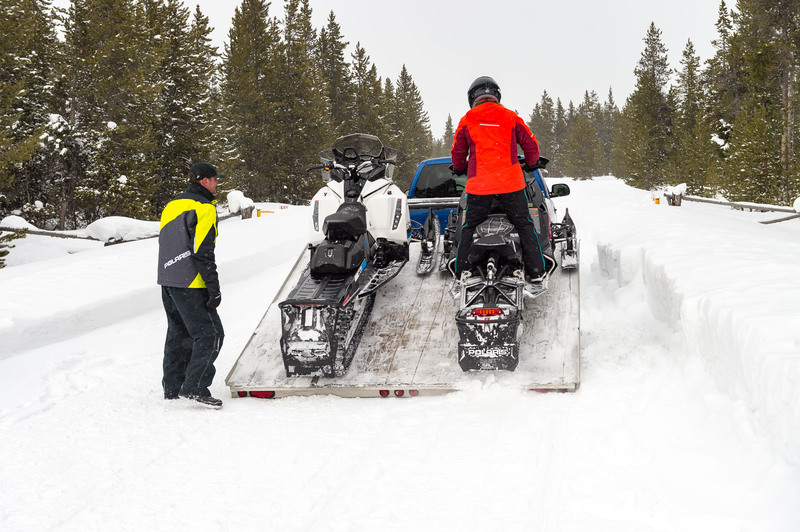 But when you stop to consider the value of the sled cargo being towed, isn’t it sensible to make sure your trailer can tow your snowmobile(s) safely, securely and easily while keeping them properly protected? Back when none of us travelled very far to find snow, any old trailer would do. Typically, most riders’ first trailer was an open flatbed that was mostly used locally, often only to get sleds serviced. But as our machines became more expensive and sophisticated, as winter patterns changed, and as snowmobilers are travelling more frequently to the snow, better trailers are now a necessity. Fortunately, manufacturers like Triton have responded with the highest quality and most reliable trailers on the road today. What’s your budget range for a new trailer? Will you keep the trailer for a long time? How much annual maintenance can you afford to do on the trailer? What’s your best guess about how many times a season the trailer will be used? Will its usage be primarily local, farther away or a mix? How many kilometres will you trailer in a season? How many sleds will you usually need to transport on the trailer? Do any sleds need to be secured on the trailer when not in use or between trips? What size trailer will fit to drive into your access road or driveway? 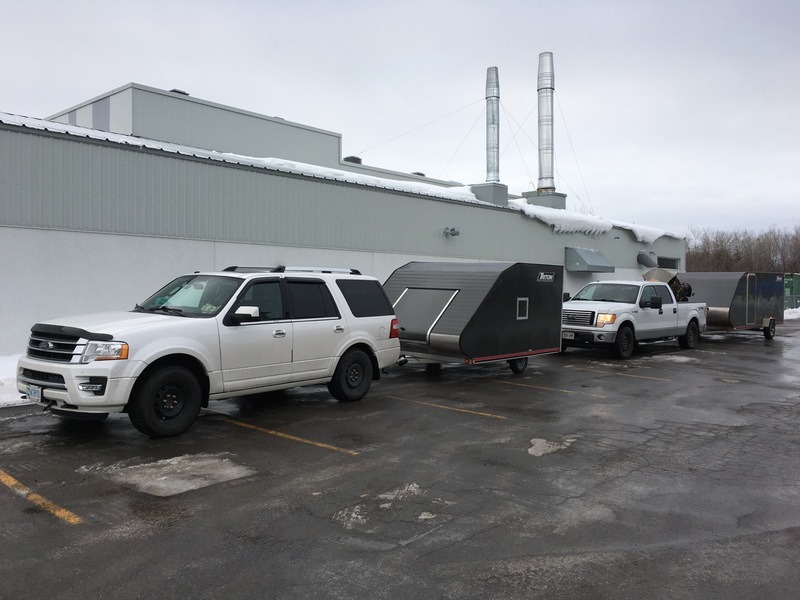 What size trailer will fit in available space at home or cottage when parked? Where do you plan to store the trailer off-season and how large is that space? Do you need a secure trailer to store your sleds in during the off-season? What other transporting uses might you have for the trailer? What’s the maximum weight (including sleds) your tow vehicle is rated for? Does your tow vehicle have an integrated tow package capable of handling the trailer? Next, you’ll want to familiarize yourself with trailer terms such as tongue weight, axle rating, carrying capacity, and maximum trailer weight. Also, don’t overlook tow vehicle terms including Gross Axle Weight Rating (GAWR), Gross Combination Weight Rating (GCWR) and Gross Vehicle Weight Rating (GVWR). Google them for more information, because trying to explain them here would take too much space…and likely put you to sleep. Suffice it to say, they are things you need to know to have a meaningful conversation about trailers and to make the right purchase for you. As with anything, you get what you pay for with trailers. The key is to get as close as possible to what you’ll need most of the time without over spending on functions and accessories you don’t really need or will never use. 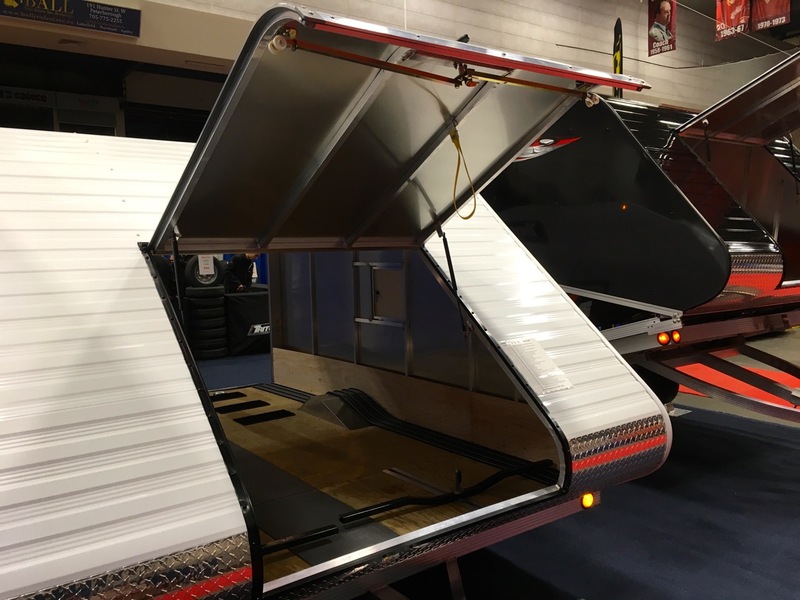 Open, enclosed or hybrid trailers or trailers with a cover? Steel frame vs. aluminium frame construction? Larger vs. smaller tires (also check out radials)? Leaf spring suspension vs. rubber torsion axle? Trailer height, weight and shape for best towability? The quality of the wiring harness and other critical components? Must-have accessories for me include ski guides, tongue jack, spare tire and carrier, and fuel door (for enclosed trailers). 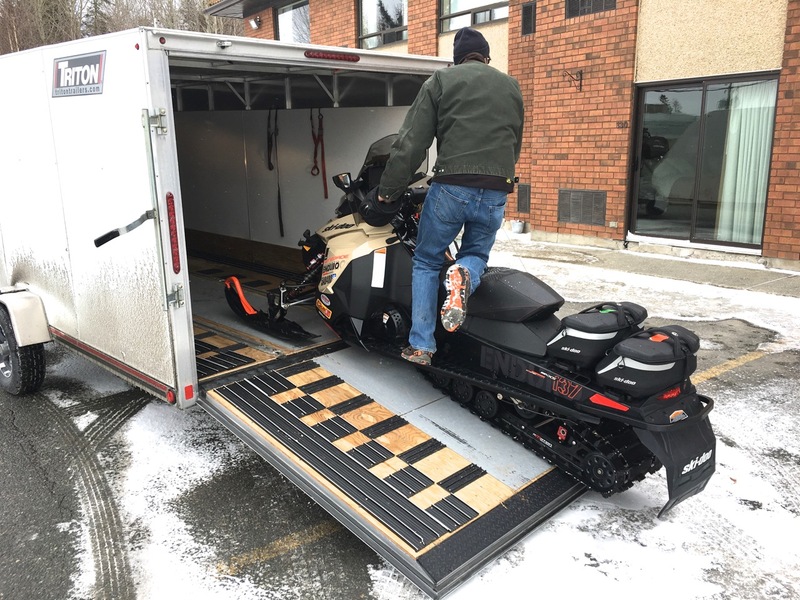 More snowmobilers are discovering that the traditional flatbed, open snowmobile trailer doesn’t suit their needs anymore. That’s mainly because many trailers are now being used more often. Their making longer hauls, in more severe driving conditions, and with more weight on board. So an economy unit that was adequate to transport a sled back and forth to your dealer twice a year is unlikely to withstand today’s increased demands for long. Or give your precious sleds much protection either! In my experience, anyone who tries an enclosed trailer will rarely choose to go back to an open bed model. The sheer pleasure of unloading a clean sled, not covered in an unsightly coating of road yuck will make your day! A properly maintained snowmobile trailer should do yeoman’s service for years. So it’s worthwhile to invest your money in a top quality hauler like Triton to avoid those roadside breakdowns that can make trailering a nightmare. Generally, you should expect to spend between $3,500 and $6,000 for an enclosed, two bed snowmobile trailer. It will render years of reliable service if taken care of properly. I like Triton because their aluminum frame won’t rust and is very light to tow. Finally, don’t assemble your ideal hauler piecemeal from the after market. It’s likely cheaper to buy as much as possible in one complete package up front. If an item doesn’t come as standard equipment, ask about the cost of upgrading. Trailer and accessory manufacturers are always coming up with something new. Often this is for use by other kinds of haulers or in other seasons. So occasional browsing in trailer speciality stores and catalogues will sometimes yield a new gadget or gizmo that can be adapted to make your snowmobile trailering even easier! CLASSIC VIDEO! Learn more about trailering in this classic Snowmobiler Television clip from The Intrepid Snowmobiler.